Students who received scholarships from the National Co-operative Credit Union (NCCU) last Friday have been urged to ensure they get a good education. 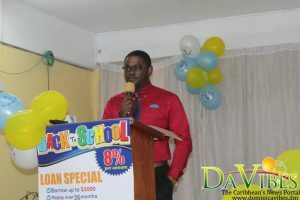 Acting Chief Executive Officer of the NCCU Curth Charles said the NCCU is committed to raising the quality of life for the young minds in the country especially the children of its members. While addressing the fifteen scholarship recipients he urged them to always remember that a good education is the foundation for any career path they may choose. Charles added that being a successful student through secondary school is not as difficult as they may think it is. He therefore advised them saying “be prepared to do your homework, studying hard [for] every test even if it’s not your favourite subject, show up to school on time, pay attention in class, completing your assignments on time, participating in school activities, always read a book and stay out of trouble”. He also encouraged parents and guardians to take an active role in their child’s education in addition to showering them with support, love and encouragement to stay on the right path.